Following Caprica, a beautiful if unwatched experiment in radically altering the Battlestar Galactica formula, Syfy tried to get back to the roots of the franchise's mass appeal — battles with Cylons — in the online series/TV film Blood & Chrome. The result is a tasty morsel for Galactica fans, if ultimately failing to deeply satisfy in the way the prior series did. The cast is ideally shaped for this venture, as the story keeps us tightly bound up in the misfortunes of our three main characters: co-pilot Coker (Ben Cotton, Stargate: Atlantis, Alcatraz) as our foil, Cylon-hacker Beka (Lili Bordán, Cherry.) as our supplier of Macguffins, and of course the very same Adama (Luke Pasqualino, Skins, The Borgias) as our hero. While the amalgamated film's best lines—I'm looking at you, "you're going to regret this"—are reserved for Beka, it's by far at its best when it switches into character development mode and offers up a confrontation between Adama and Coker, two highly confrontational characters, fortunately for us. Adama's got a larger backstory than any of the other BSG characters by far now, and it would have been easy to get lost in it. But the evolution of their relationship was very well handled, making it the major force tying the series together. While details of the technology kept us firmly rooted in a version of the Caprica universe, which was a nice touch, it was really Bear McCreary's score that keeps us feeling like we're back in BSG, while the blending of Galactica's percussive style with stronger melodies reminds us that we haven't quite gotten there yet. We need McCreary's score because, unfortunately, the space battles don't feel like BSG. They're a little too clean, almost like they absorbed the practices of the many inferior imitators of Galactica's unique style of space effects. In one case, where the battle takes place in virtual reality, this is actually a positive: I was reminded of how the VR-obsessed society of Caprica seemed not to notice the increasing unreality of the world they were building. We have to wait until our three main characters have left behind the world as we know it, along with any chance of further space battles, before we can really get comfortable with them. The web series structure really hurts the resulting film. It seemed to be more of an urgent issue to move characters from place to place, and to set up the next cliffhanger, than to build story arcs into the overall product that would really intrigue. When I got to the final reveal, I felt, "that's all this was about?" Because BSG has always had a sense of urgency. The crew of the Galactica fights for the survival of the human race; the citizens of Caprica, try as they might otherwise, allow their subconsciously treasured character flaws to plunge humanity towards its doom. We don't have any of that here; instead, we have the story of Adama's first adventure. Even a sort of callback to the famous Galactica "flashlight" scene lacks one tenth the drama of that first-season highlight. It's a fine adventure for BSG fans in the mood to revisit the universe, but not the Grand Adventure we've really been looking for. Video: A fine transfer. I was distracted in the daytime snow scenes by how the falling snow's motion was completely detached from the apparent camera movement, though; that's more a testament to the transfer quality, though, than a blemish on what was certainly a budgetarily constrained production. So I can abide that, but not two Universal tags, one after the other, right as proceedings are about to start. Audio: An excellent exercise, that Hollywood might want to heed, in how to tune your dynamic range so that you can actually hear dialogue over explosions. Nice job. Special features: An SFX featurette, and a whole slew of deleted scenes. Definitely watch at least a couple deleted scenes; the visual effects are left out, leaving a lot of green screen, and giving you a nice taste of the challenges of acting in such a production. 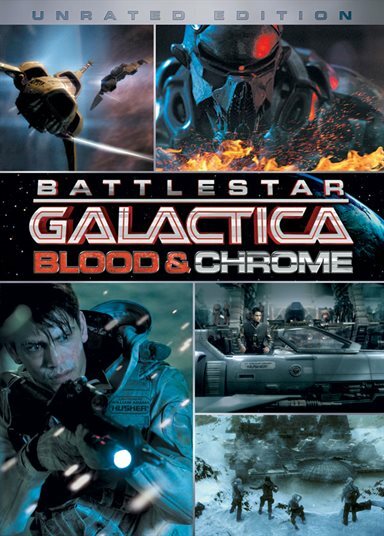 Download Battlestar Galactica: Blood & Chrome from the iTunes Store in Digial HD. For more information about Battlestar Galactica: Blood & Chrome visit the FlickDirect Movie Database.